I love to doodle, especially during breaks in playing. 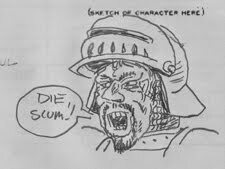 Inspired by the likes of “Planet Algol,” I too have decided to scan and post some of the more ‘casually produced’ artworks drawn on the backs or margins of character sheets. Above you can see my version of a ‘leechman’ who was some monster from ‘The X Files’ I think. Creepy. My doodles are not normally this finished. Above you see the player characters standing for a group portrait for one of our campaigns (my PC was the sorcerer, Corian). The drawing was made by request of one of the players. This is a little doodle done from the same campaign as the group portrait, above. 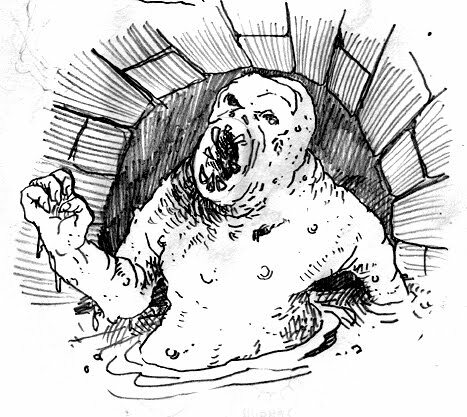 One of the players (Jon) had the worst case of gas we ever smelled… so I drew his PC farting into the face of the halfling thief. 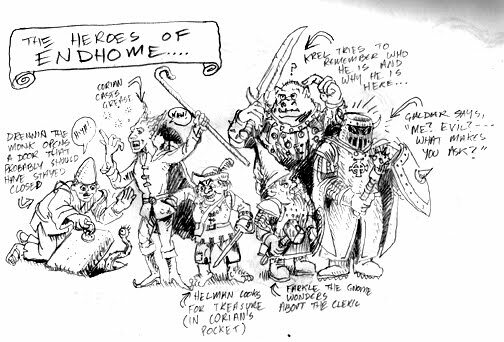 It looks like I also drew one of those green tree air freshners hanging in the air behind the halfling’s head. 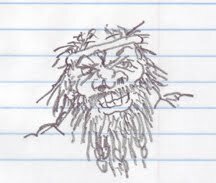 This was drawn in the top margin of my notes from the session, which took place on 4-11-2008. 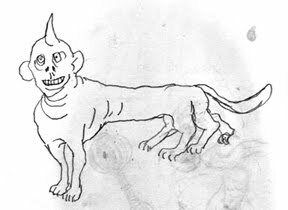 Some sort of dog with six legs, a human head and a single horn. I have no idea why. Believe it or not, I don’t even take drugs — these things just come into my mind with no chemical stimulation. Here is a picture that should probably be forgotten and will be brought up as ‘exhibit C’ at my trial after I finally snap and go on a rampage. 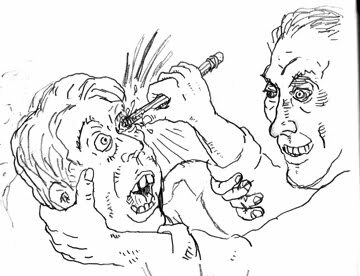 That is a self portrait of me jamming a pencil into the eye of someone I knew and I hate because he went out of his way to make my life harder on several occassions. Chris, if you are out there — one day, when you least expect it, I am going to poke both of your eyes out with a number 2 pencil. Just kidding! Here is a cyclops of some sort wearing armor. That mace means business! One of my characters from years ago — Krondor! Although he is only level 2, Krondor seems to have rated BOTH a close up porttait and a full body portrait. 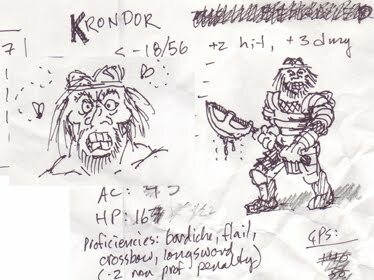 Krondor has an impressive 18/56 strength and appears to be proficient in the bardice, flail, crossbow and longsword. With an intelligence of 7, Krondor appears to be destined for the fighting trade. 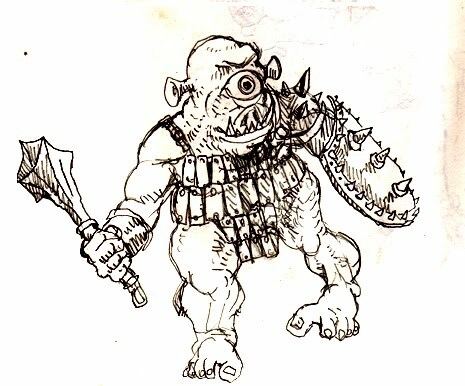 He runs around in banded mail and, according to his very messy PC sheet, has ownership of a helmet made from an ogre’s skull, a p[air of mithril gauntlets with spikes and a +2 battleaxe (along with all of the usual impedimenta of the dungeoneer). Unfortunately, Krondor is not proficient in the battleaxe, so he would probably be better off sticking with his bardiche. I’d love to take Krondor out of retirement and let him cleave some skulls so he can earn enough XP to get to level 3 (at which time he gets to add another weapon proficiency — I’m betting Krondor goes with battleaxe!). This is Schlomo aka the yellow priest. 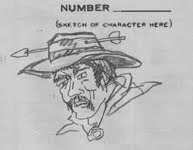 He is one of my current characters in a campaign being run by my friend Jon C. where we all have evil characters. 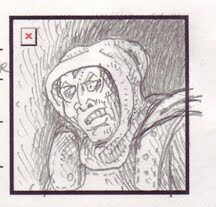 You can tell he is evil by the way he is grimacing. 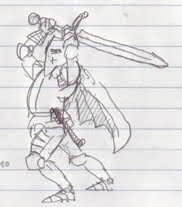 This is ‘Lord Zelf Nark of Fizoul.’ I don’t remember this PC very well at all but he appears to be a 9th level fighter with all sorts of magical gadgets — +1 armor, a +3 frost-brand sword, a +1 mace which he has named “smasher” and gauntlets of swimming and climbing as well as some various potions and scrolls. One of his companions was a half-orc named “Pig Face Louie.” I scanned Louie’s portrait but think I forgot to save it, so I’ll hopefully remember to rescan it sometime. This dwarf is named Ertl Stinkfingers. He has big teeth and wears a headband (is he in some 80s arena rock outfit?). I don’t think Ertl ever got played, so he lays in my “character file” as a potential future character. This is Dudley the Ranger. As you can see, there seems to be an arrow through his hat. Dudley is as powerful as Lord Zelf Nark of Fizoul, but not as evil. This is another character named ‘Buckey’ who apparently has platemail and a 2 handed sword. Check out the action pose! Somehow, the name “Buckey” makes him sound like he belongs on the Little Rascals. I decided to rework the proposed cover of Exquisite Corpses (I’m a one man band, so these things take time) but have been unable to spare much time to paint (job hunt, playing games, a re-tile project at home and other stuff), even though I am eager to get this thing going. I discovered that I enjoy seeing paintings “coming along”and have a vague idea that by periodically photographing stuff as I work on it, I can learn more from comparing previous versions with the current state of the illustration. Here is the same painting after around 2 or so hours of work and again after hours 3 or 4. I’ve really been into 1930s-1950s ‘pulp crime’, horror and sci-fi mag covers for a while now. This is supposed to be a wrap around cover, so the left side will be the front cover and the right side will be the back (hence dead space at the top for title, etc.). 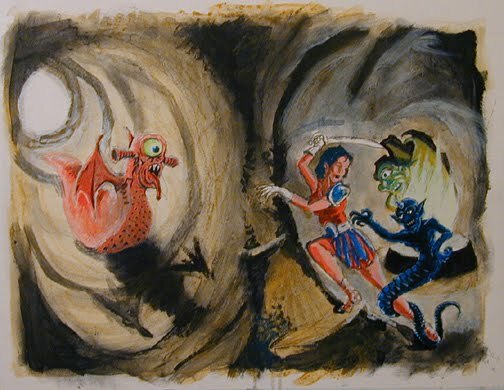 The woman’s costume is intended to look equally at home in Flash Gordon’s universe or Hyboria… a snake man coils around her leg and various other beasties loom in the back, gathered around a fire. I intend to add more monsters back there. The pink fleshy cyclops slug with wings and a big tongue turned out pretty good I think. I’m pretty fond of it thus far and think it promises to be much better than the first version (see earlier posts like this one). I like the pose of the woman much more and I think it will make more sense to the viewer what is going on. I hope to be able to put in some time on it next week; between having guests over this weekend and 100 other things, I am pretty busy right now. 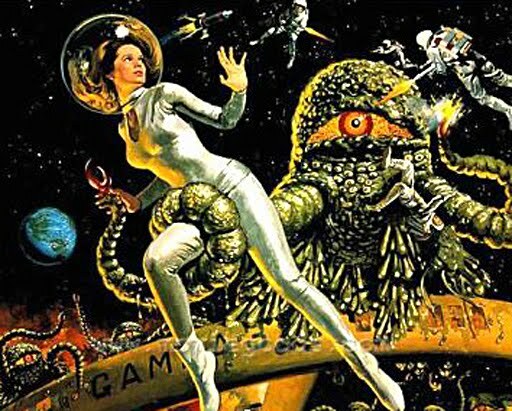 I think if I run another game, green slime is going to need a serious work over. In one of Fafhrd and Mouser’s later stories by Fritz Leiber (I think it was “The Knight and Knave of Swords“), Odin and Loki end up in Newhon because their last worshipers on their home world have died (presumably that was our earth, which Leiber made mention of before as a ‘different’ world than Newhon; although if it was another dimension or just another planet is not made clear if I recall correctly). Weakened by a lack of worshipers, Loki and Odin somehow wander to Newhon where they arrive, barely alive, and are adopted by Fafhrd, the Mouser and their friends. They build up the power of these gods and nurse them back to health because they hope these gods can help save Newhon in an upcoming battle, but after the battle Loki and Odin try to betray them for more power. Happily, the evil Norse gods are frustrated in the attempt (although Fafhrd makes a painful and unintended sacrifice of his left hand to Odin). A similar conceit (where gods gain power from their followers) is introduced in L. Sprague DeCamp‘s Reluctant King books. Jorian, the main character, finds a small statue that he keeps… and every night the god represented by the statue appears in his dream since he is now that god’s only contact with the human world (all of the rest of his followers having died). What makes it funny is that the god is constantly whining about how long it has been since someone brought him flowers and seems more of a pain than he is worth. Finally when someone steals the statue and the god disappears, Jorian pretty much considers it good riddance. Everyone keeps telling me I have to read ‘Small Gods.’ It’s on my list. The idea that fantasy gods draw their power from their worshipers is one that appeals to me, and I enjoy the idea of a dynamic roster of gods whose power rises and falls with the fortunes of their churches in the material planes. OK; here is where I call this one ‘finished.’ I could keep working on it ad infinatum, but I think I made some mistakes early on (particularly in layout/positioning of the figures but also in rushing through the initial sketch — the figures look particularly wooden and stiff) so I’m going to move forward and see what lessons I can draw from this while forging ahead. I definitely need to work on my patience and try to find more ‘source material’ to use for the positions of hands, muscles, etc. Both of these figures look like scare-crows or robots and the slugbats look like flying green bananas. 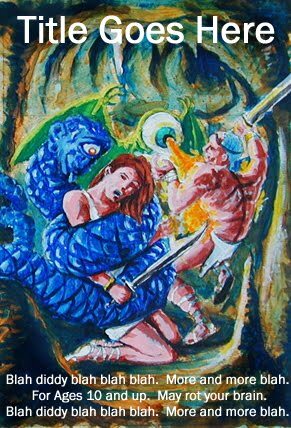 I think the blue snake-man looks wierd the way he is wrapped around the pillar (it does not look 3d to me) and I wish I had made his body skinnier. I like the cave but need to work on making the rocks appear more textural. 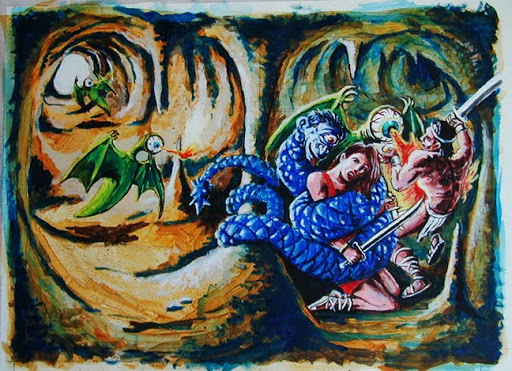 I also think the cave should be much darker and rougher-looking. I look forward to trying this again! This is the current state of the painting. I feel a lot better about it but think it still needs a ‘layout’ revision (see yesterdays post). I’m enjoying seeing the progress from the series of snapshots I have been taking (even though the quality of my digital camera leaves a lot to be desired). 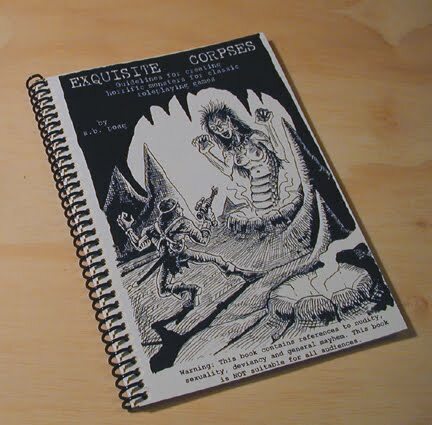 Other good news is that I got a ‘proof’ copy of Exquisite Corpses back from Lulu this morning and look forward to cutting the pages and trying it out. Stay tuned and thanks for all of the encouraging messages. 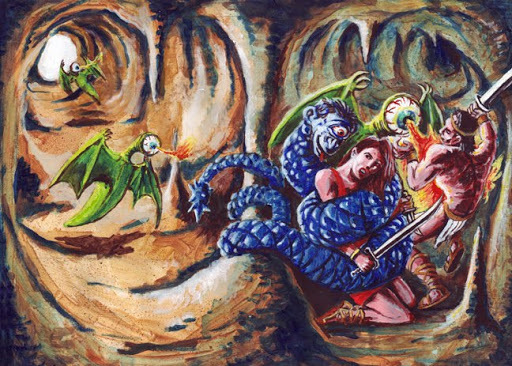 I did a little more work on the “slugbats” and the humans, some work on the snake man and added the underpaint for the flames that the slugbats can shoot out of their eyeball. 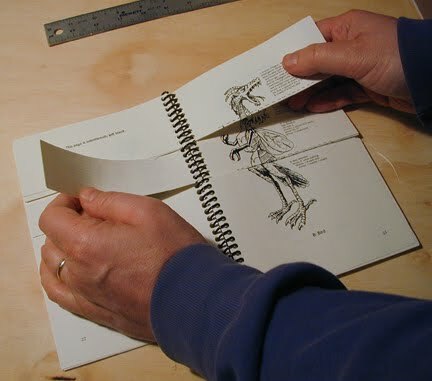 Although I like the general layout, I worry that once I crop it (so the left side ends up on the back cover and the right side ends up on the front cover), the image may not make a lot of sense. 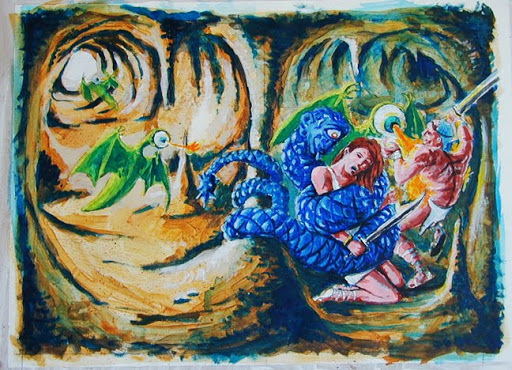 I also don’t like how 90% of the slugbat that is blasting the man is hidden by the snake and the woman, or that 90% of the woman is wrapped up in the snake… so after I work on this some more (for the practice) I’ll take another crack at it. I have a book with lots of ‘pulp era art’ — one image of which I think will work if I swipe the layout. 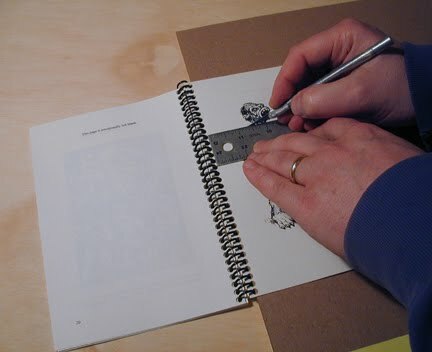 The book is “Art of Imagination” that I bought at closeout a while back — the book is worth more than the ~25.00 that the used sellers are charging for it on Amazon (in my opinion). I’ve never read the text, I’ve just looked at the gorgeous reproductions on every page. But I plan to do a lot more work on this one before I give up on it — even if I don’t use it for Exquisite Corpses, I need the practice!